Tomorrow (Saturday, March 22nd) Cuban Olympic gold medalist Odlanier Solis and US veteran Tony “The Tiger” Thompson collide in Tekirdag (Turkey) for the vacant WBC international heavyweight championship. 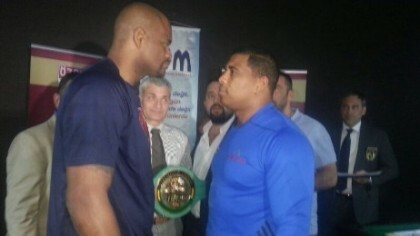 At today’s official weigh-in Solis brought 257 lbs. (116.7 kg) to the scale while Thompson weighed in at 266.5 lbs (120.9 kg). The show in Tekirdag, Turkey, will be promoted by ARENA Boks Sportif / Ahmet Oner and broadcasted live in Turkey (Kanaltürk), the UK (Boxnation), Germany (sportdigital in association with Sky) and about 50 other countries worldwide. The live broadcast starts at 9.35pm (21.35h) Central European time.